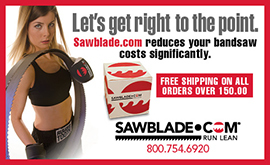 Here at Sawblade.com, questions arise with regard to perceived saw blade problems. After a few inquiries, it can be determined if the machine operator made any miscalculations with speed and feed, the materials being cut, TPI, and any other variable that ends up impacting the cutting process. In most cases, the customer already knows exactly what is needed. The operator knows the blade size, length and width, the thickness of the blade being ordered, and they know the materials to be cut so there is often no need to ask about carbon, bi-metal, or carbide blades or the proper tooth pitch required for that particular job. There are times when a new saw operator enters the picture, and then asking the right questions become imperative in order for the right answers to be obtained. And receiving accurate answers becomes paramount to the bandsaw operator receiving the right saw blade for the job. Here is a very simple process in making the correct determination of proper tooth pitch. It is necessary to any cutting job and based on the type of materials being worked. A general rule of thumb: the greater the TPI, the smoother but slower a cut. Fewer or less TPI allows for a rougher but faster cut. TPI and proper feed rate are the two most important factors to consider when cutting. 4 TPI will make a fast cut — 14 TPI will allow for a slower cut but will leave a smoother finish. A coarse tooth saw blade setting — 2-TPI and 3-TPI — should be used to cut woods. A finer tooth saw blade setting — 18 to 32 TPI — should be used for thinner metals and plastics under 0.25″ (or 1/4″). Industry standards are — a minimum of 3 teeth in the cut — a maximum of 24 teeth in the cut — with the optimum number of 12 teeth in the cut. The average TPI in a 3/4 blade is 3.5 — if you multiply 3.5 by the 4” Round Bar, your average number of teeth in the cut is going to be 14. 14 falls just outside of the optimum and well under the maximum number of teeth in the cut for effective and efficient cutting. Hopefully, this will help to better understand TPI and its impact on production. Knowing TPI when cutting a particular type and size of material using a bandsaw blade that is designed specifically for that material and cut will assure quality output. This entry was posted in All Posts and tagged advice, bandsaw blades, bandsaw machines, guidelines, information, measurement, saw blades, Teeth Per Inch, tooth pitch, TPI. Bookmark the permalink.